My first LP was Led Zeppelin IV. My first CD was Peter Gabriel’s So. I don’t know what my first download was because my first downloading experience was during the Napster era, and it was a little like looting a liquor store after an earthquake: we grabbed anything our bandwidth could carry. In 1979, Michael, my girlfriend Tina, and I discovered Pink Floyd’s The Wall. We listened to it and got emotionally involved in it. It carried us places no music had before. That was at the core of my becoming a Pink Floyd fan. There are a lot of amazing songs on The Wall, but many of us liked to think that Pink Floyd wrote The Wall just for us, and the song for me (and a lot of kids like me) was Comfortably Numb. We stayed up late in our dorm rooms or crashing at some buddy’s place, or driving with the guy who had the best stereo, listening to Comfortably Numb and becoming comfortably numb, whatever it meant to each of us personally. I spent late, late lonely nights, playing Comfortably Numb on my headset at rock concert volume levels, being moved to tears by the images it conjured inside me. For years after that, if someone asked me, “What music do you like?” the first band on my list was Pink Floyd. I saw the movie The Wall and became a fan of it, although by then I had built so many stories in my head to go with the music of The Wall that the movie didn’t deliver my fantasies to me. Last week Pink Floyd released The Endless River, a collection of mostly-instrumental music culled from the cutting-room floor of the last 20 years or so. It has been met with decidedly mixed reviews, and I can’t disagree with the critics. But I also see a real value for me in nostalgia for Pink Floyd, and The Endless River works for me in this capacity. 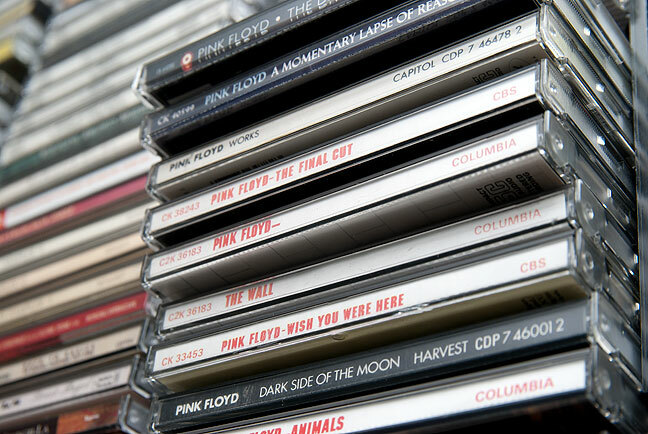 I’ve had some of these Pink Floyd CDs since the day they came out, and the older ones replaced LPs that I owned the day they came out. In the years after Pink Floyd front men Roger Waters and David Gilmour parted ways, with Gilmour claiming Waters wasn’t part of the band and Waters claiming the band wasn’t Pink Floyd without him, it got harder to care about the band. The music lost its narrative, its genius, it brilliant messiness. I think this is because they were both wrong, and Pink Floyd wasn’t a group of members, it was a moment in music. I always sensed that post-Waters Pink Floyd were always saying, “We’ve got to be the smartest, the most amazing, the most enigmatic, the deepest.” and that fact sometimes kept them from being themselves. The Endless River is supposedly the last album from Pink Floyd, since keyboardist Rick Wright died in 2008. I am listening as I write this, and the music has some real strengths. But I’m no different than the rest of the fans who compare it to the music we grew up hearing; Meddle, Animals, Atom Heart Mother, Wish You Were Here. Of course, I’ve already bought it on iTunes. I am, after all, a fan. While I never listed Pink Floyd in my top five favorite bands (and I did make such lists fairly often), I occasionally put Comfortably Numb in my top five song list. It certainly got a few hundred listens from me. Like you, I identified with it in my own way, thought it was written for someone exactly like me and perhaps BY someone exactly like me (just with more musical talent). There are some things to consider about the Waters leadership/contribution. Meaningfulness so often is the child of pain. This is a very interesting thought to possibly apply to other collaborations as well. -“Pink Floyd wasn’t a group of members, it was a moment in music.” As a artist This feels disappointingly and suspiciously true. Humbling and enigmatic. I’m gonna have a real think on this one. I agree it is not a step forward for PF. But I also agree with you…at the end of the day, I am a fan…and in that regard, the album is FANtastic! On my second read, this was the most poignant phrase of the entry, and true on so many unrelated levels.